Saint Peter leaps into the water to go after Our Risen Lord in today’s Gospel. He gathers up his garment and just goes for it. Splash! Right in. After three times denying Christ during His Passion, Saint Peter has truly demonstrated his turn around, his volta, if you will. This image of his light garments puddling around him as he swam toward Christ makes me giggle. I look back on my relatively middle-sized life. I’m just freshly thirty-four. I look back and wonder, when did I jump in the water after recognizing Our Lord? Me, a nearly middle child who maintains relationships and keeps the balance in the boat. When? 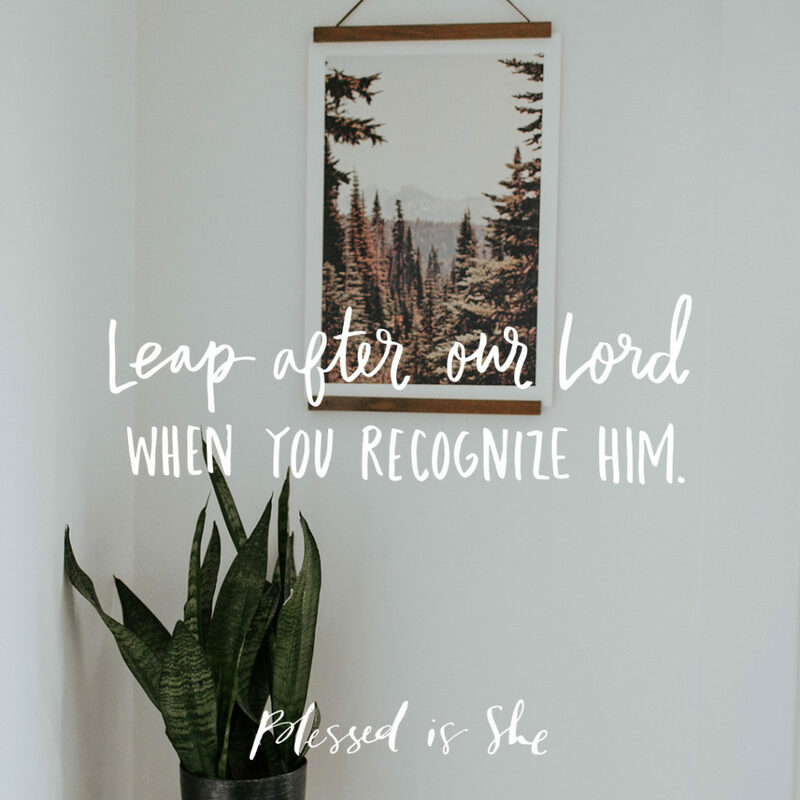 Saint Peter here teaches us to leap after Our Lord when we recognize Him, when we know in our hearts it’s the right thing to do. Whether others don’t know or don’t splash on in. I was a sophomore in high school, and it was our Spring Break choir trip in Arkansas. One Saturday night of our tour we sang at a Catholic church at the vigil Mass, right off to the side of the altar. And when the time came for the Consecration? When we were in a church with no kneelers and no bells, none of the familiarities of home? My palms broke into a wild sweat and my face a deep blush. Should I kneel? Should I? I’m in choir formation and no one else is kneeling. Flickering eyes left and right assured me that it would be just me. I splashed in. I knelt quietly with eyes very firmly shut, teeth fastened tightly, determined to be calm while simultaneously leaping after Our Lord. For me and my traditions, I needed to kneel, I needed to acknowledge this was how we did it in my family, no matter how awkward I looked on top of being an awkward sophomore. When I peeped open slowly before shuffling down the side aisle for Communion, I saw others of my friends kneeling. Maybe I was the inspiration, maybe they needed to know it was okay, or maybe they happened to kneel too on their own, making their own brave splash. Whether you’re a young adult struggling to evangelize inconspicuously at your new job, fresh out of campus ministry at college or you’re a grandmother attending a new volunteer training, splash in, sister. Just splash in like Saint Peter. Whenever the opportunity arises, splash after Our Lord. If today you recognize Our Lord, pray for the courage to go after Him, follow in His steps, and do the right thing. Nell O’Leary is a recovery lawyer who lives in the great city of Saint Paul with her husband and four children. She’s passionate about hot cocoa, the oxford comma, blogging, and her role as Managing and Content Editor for Blessed is She. Find out more about her here.